It looks like it holds a galaxy within it. I can imagine all kinds of things in rain drops like that. 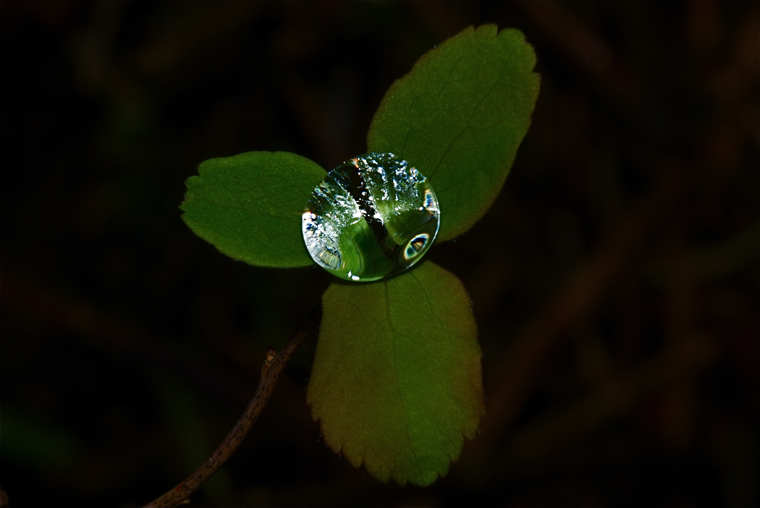 This one intrigued me because of the relative size of the drop to the leaves. I wonder just how many things like that I miss! I thought it was a treat, too! Somehow the light was just right to make the water sparkle and it caught my attention. Luckily the camera was able to capture it, not exactly, but close enough to be interesting. A diamond but with more reflection and clarity than the brightest one. How pretty! It did look a bit like like a diamond when I first noticed it. Some of the things that occur in nature amaze me. Beautiful! Raindrops and dew make such neat photos. They do! They are fun to find and a challenge to capture. It is a kind of treasure at that. It makes me realize how many things like this are out there that we miss. Indeed, Bo. There are beautiful little worlds that we seldom discover. Yes, I’d walk a couple of miles for that any time. It made my day. How special looking flower You have presented to us. I have never heard about it. The name is facetious, sartenada. Somehow the junction of the leaves of the little plant captured the large drop of water and it sparkled so much that I noticed it and was able to get a photo. I don’t even know what the plant itself is. I’ve never seen anything quite like it myself.